For the past two decades, there has been a legal fight over whether consumers have had a difficult time comparing Apples to Apples. More specifically, Britain's Apple Corps Ltd.—the company started by the Beatles and currently owned by Paul McCartney, Ringo Starr, John Lennon's widow Yoko Ono, and the estate of George Harrison—was at odds with America's Apple Inc., maker of Macintosh computers and iPods, over who had the rights to the Apple name. It may seem odd to trademark a fruit's name, although no odder, perhaps, than trademarking Sun, Amazon, Staples, or any other noun. But especially in the information age, the value of a brand name can be crucially important. Suppose I wrote a program, called it "Windows Vista," and sold it online for $30. If it looked just the same as Microsoft's Windows Vista, customers might very well be confused as to which one was the genuine article. This confusion would harm Microsoft. Similarly, argued Apple Corps, the existence of Apple Inc. using the Apple name and logo had an adverse impact on Apple Corps' business. According to Nobel Prize–winning economist Ronald Coase, the appropriate solution in the case of externalities like this is to have a strong system of property rights. As long as the two parties can bargain with one another, an efficient solution will be reached. Today, an efficient solution was reached—although it was hardly cost-free. According to the terms of the deal announced today, Apple Inc. will own the entire Apple trademark, and will "license certain trademarks back to Apple for continued use," according to Reuters. In many ways, this is a textbook application of the Coase Theorem. The usual example used to illustrate the Coase Theorem is that of a factory and a fishery that operate along the same river. The factory pollutes the river, which has an adverse effect on the fishery. If the two firms act separately, the factory doesn't take the costs of its pollution into account when figuring out the optimal amount to produce. If the fishery buys the factory, or vice versa, then the combined company is hurting itself when it pollutes, and so is more likely to cut back pollution to the efficient amount: that is, the amount where the marginal benefit of additional pollution to the factory is equal to the marginal cost to the fishery. Similarly, now that Apple Inc. owns the rights to both trademarks, it will presumably be careful not to diminish the Beatles' Apple image—if, indeed, being associated directly with iPods would be considered a negative in today's world. 1. Apple's Steve Jobs released a statement saying, "We love the Beatles, and it has been painful being at odds with them over these trademarks." If this dispute was essentially friendly, why did it take 20 years, and huge sums in legal fees, to resolve? 2. Many analysts are now predicting a deal that would make Beatles music—which has so far not been available on any online music service—available via Apple's iTunes. According to the Reuters article, "A source familiar with the situation told Reuters at the time that it was 'safe to assume that something sooner rather than later will happen.'" 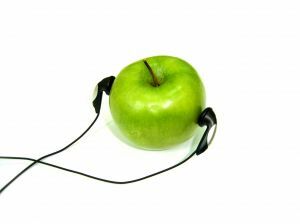 What effect, if any, do you think the prospect of selling Beatles music on iTunes had on resolving the dispute between the two Apples? 3. The two Apples had reached an agreement in 1991 stating that Apple Inc. could use the Apple logo as long as it didn't enter the music business. When Apple Inc. launched iTunes, Apple Corps sued, saying that Apple Inc. had violated that agreement. Apple Inc. countered that iTunes was just a "data transmission service." Do you think iTunes constitutes a move into the music business? Why or why not?